A one-step method enables scalable and more environmentally friendly production of plant-derived plastic monomers, paving the way towards the mass production of a sustainable alternative to petroleum-based materials. An international team, including Kiyotaka Nakajima of Hokkaido University, Japan, and Emiel Hensen of Eindhoven University of Technology, the Netherlands, has developed an energy-efficient method to synthesize bioplastic ingredients. The new technology will contribute towards the realization of sustainable 'green products', such as completely biobased beverage bottles. This study was conducted jointly with Mitsubishi Chemical Corporation and the findings were published in ACS Catalysis. Biobased plastics are emerging as a next generation material and are expected to replace petroleum-derived plastics. A plant-derived polyester, called polyethylene furanoate (PEF), is a promising 100% renewables-based polymer derived from plants that can replace the giant of the plastic industry, polyethylene terephthalate (PET), due to its better physical, mechanical and thermal properties. However, realizing large-scale PEF production is seriously hampered by an inefficient production of the monomers. Aerobic oxidation of a biomass-derived substrate called HMF in methanol and ethylene glycol produces monomers called MFDC and HEFDC, respectively. They are recognized as crucial monomers in the manufacture of PEF, because polymerization of MFDC with ethylene glycol or self-condensation of HEFDC can yield high-quality PEF (Figure 1). 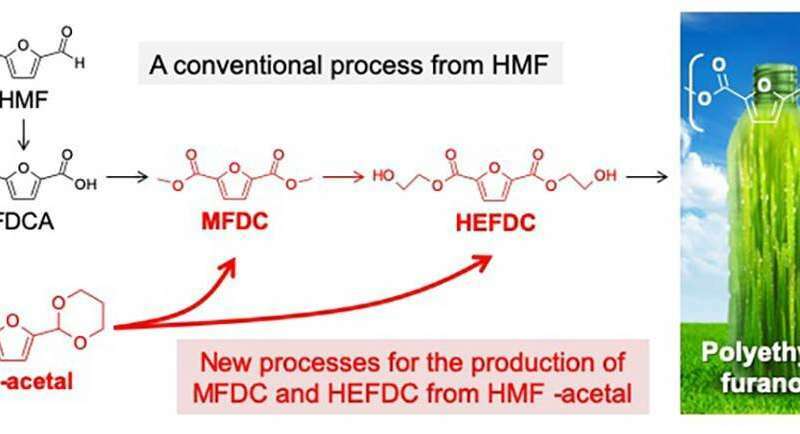 However, MFDC production has so far been exclusively studied for dilute HMF solutions, and more desirable routes for the production of HEFDC is currently impractical because a high-yield of the monomer cannot be produced efficiently. This limitation can be attributed to the highly reactive formyl (-CHO) groups in HMF, which are involved in heavy side reactions, especially in concentrated solutions: chemical transformation in concentrated HMF solutions that aims at large-scale production of commodity chemicals is accompanied by the formation of huge amounts of solid byproducts. Nakajima, Hensen, and their colleagues previously developed a more stable compound called HMF-acetal (Figure 1). They have now examined the utility of HMF-acetal and found that 80-95% of HMF-acetal in a concentrated solution (10-20 wt%) can be successfully converted to MFDC and HEFDC with a gold nanoparticle catalyst. The present results represent a significant advance over the current state of the art, overcoming an inherent limitation of the HMF oxidation to important monomers for biopolymer production. The researchers note that this method has "less reaction steps, and the use of highly concentrated solutions will require less energy than conventional processes." The researchers expect the new technique will not only improve the feasibility of commercial PEF production in the chemical industry, but also help advance a more ubiquitous use of bioplastics, as well as provide insight for the development of other bio-based chemical applications from various biomass-derived carbohydrates.